In the land clearing industry, hydro ax mulching has introduced a highly efficient method for clearing out trees, undergrowth, and more in a fraction of the time. Also known as hydro-axing and simply hydromulching, this technique uses powerful machinery to quickly turn trees into mulch where they stand. Rather than the outdated method of bulldozing an entire space of land, hauling away the debris, disposing of it, and then possibly repairing damaged soil, hydromulching completes all of these steps at once. 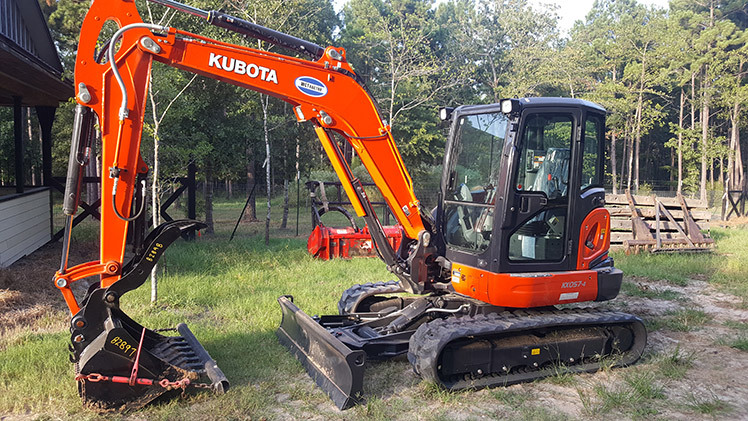 At Texas Ace Land Clearing, we're able to complete the grading, leveling and trenching of your land with precision in a timely manner. Our trained experts have years of experience in analyzing the needs of a specific piece of land and tailoring it to fit your vision for the build or development plans. Schedule your appointment with Texas Ace Land Clearing today to discuss how grading, leveling or trenching can help you in the development process.